Cauliflower was brought to England by Flemish weavers in the mid-1600s. Purple cauliflower is a heritage variety that comes from either Italy or South Africa. Its true wild origin is not quite known, though its color is naturally occurring and is not due to scientific manipulation or breeding. Anthocyanins are water-soluble pigments that also give red cabbage, purple cauliflower, and purple asparagus their vibrant color. Purple plants are not only beautiful to look at they are nutritious as well. Most of the time we boil our cauliflower in water and that gorgeous color fades away much to the dismay of the kids. Tonight however, we roasted the dinner vegetables and were thrilled when the cauliflower retained it fabulous hue. On a side note, if you boil your cauliflower and dress them with lemon and olive oil, the cauliflower turns bright pink! This is the roasted cauliflower. We seasoned it with salt, pepper, garlic and olive oil. Simple and perfect. This is the little fella growing away in our garden, we planted four and so far three are producing nice tight heads. The cultivar is Graffiti. Leaf miners are a group of insects (sawflies, beetles, flies and moths) whose larvae live in the tissues of leaves and 'mine' their way through the leaf of the plant. Although visually unattactive, they do no real damage to the plant. 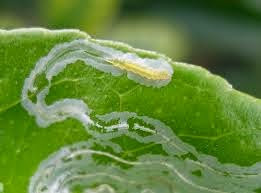 The damage they do is often mistaken for some other problem or disease such as a fungal disease, to be sure it is a leaf miner, tear the affected leaf in half and hunt the larvae down. 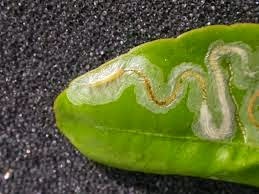 If you spot a leaf miner on your plants, you can tear the leaf off and discard it or pinch the larvae and kill it. Pesticides don't work well in regards to leaf miners because they cannot penetrate the leaf barrier. Floating row covers can prevent the adults from laying eggs.Check your leafy crops for frequently for egg and hand crush them. 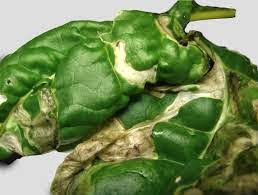 See Below for leaf miner damage and larvea. The top two are serpentine leaf miners and the third is a blotch leaf miner.